March 10, 2016 – The Deep Space Climate Observatory (DSCOVR) was built to provide a distinct perspective on our planet. Yesterday, it added another first to its collection of unique snapshots. 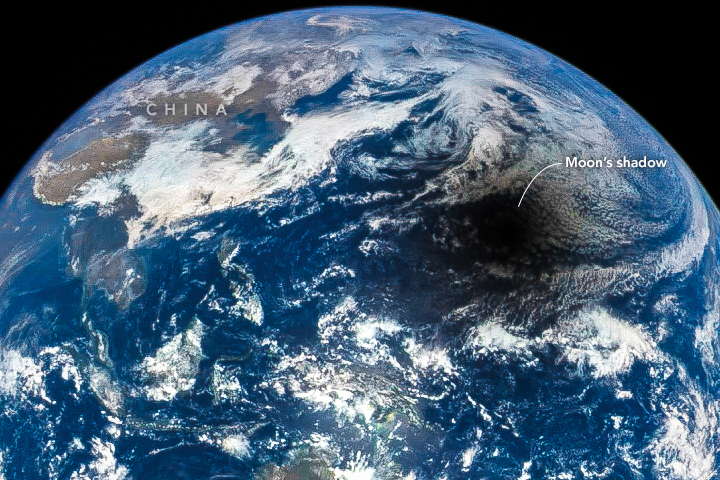 While residents of islands and nations in the Western Pacific looked up in the early morning hours to observe a total eclipse of the Sun, DSCOVR looked down from space and captured the shadow of the Moon marching across Earth’s sunlit face. The animation below was assembled from 13 images acquired on March 9, 2016, by NASA’s Earth Polychromatic Imaging Camera (EPIC), a four-megapixel charge-coupled device (CCD) and Cassegrain telescope on the DSCOVR satellite. Click on the link below the animation to download the individual images from the series. Situated in a stable orbit between the Sun and Earth, DSCOVR’s primary mission is to monitor the solar wind for space weather forecasters at the National Oceanic and Atmospheric Administration (NOAA). Its secondary mission is to provide daily color views of our planet as it rotates through the day. The satellite was built and launched through a partnership between NASA, NOAA, and the U.S. Air Force. EPIC was built by Lockheed Martin’s Advanced Technology Center, in Palo Alto, California.